With a few more appearances like the one she put in at the 41st National NORML Conference  this past weekend in Los Angeles, silver-haired Texas Republican Ann Lee won't be introduced as "Richard Lee's Mom" for much longer. 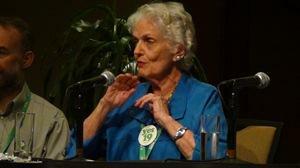 The 84-year-old Lee wowed the crowd with her feisty appearances and her call for a Republican revolution against marijuana prohibition, threatening to become a movement star in her own right, and not merely as the mother of the man who founded Oaksterdam University  and put 2010's California Proposition 19 on the ballot. The down home octogenarian also drew a long round of applause when she addressed the NORML Women's Alliance  panel at the end of its Saturday session, reiterating her remarks about creating RAMP and urging the panel and the crowd not to forego opportunities for creating new allies.